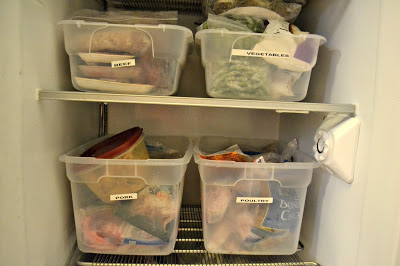 Today is Part 2 in my series of freezer basics . This weeks focus is on organizing your freezer to save money and avoid waste. Do you ever find yourself in the situation where you know a certain item is in your freezer, but you give up cooking it because it's buried in your freezer and you can't find it or it's too much of a hassle to try to find? You end up throwing out unused food because it sat buried in the freezer too long? 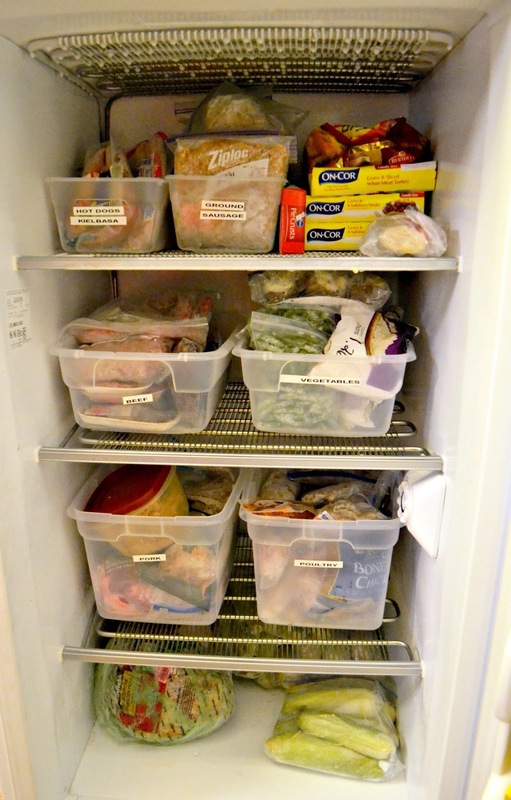 Organizing your Freezer is a great way to take stock of what you have, throw out any food item that is too freezer burned, and reorganize so every thing is much easier to locate. There are many ways to organize your freezer, according to your own needs and space. I'll share with you what works best for me. Hopefully it will inspire you to find what works better for you. My freezer is not a frost free freezer, so about twice a year, I end up emptying it out and cleaning it all out and starting fresh, the frost build up starts to take over my food otherswise. So that is the perfect time for me to reorganize and take stock of what I have. I tend to do it when we change the clocks for daylight savings, it just makes it easy to keep it on the schedule that way. Ok, lets' get the disclaimers out of the way: You should never refreeze completely thawed out frozen meats again without cooking them first. This means, you should plan on doing this project only if you can temporaily store the freezer items in coolers with ice while you clean out your freezer. Do not allow the food to completely thaw and then refreeze. I use plastic bins, some people cut the handles off of cloth grocery bags and label them. 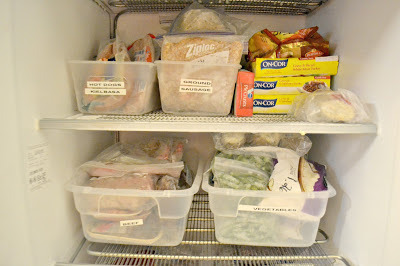 Whatever you find works best for you, organize your food into containers in the freezer. This will make it way easier to put the foods away and also to find what you need later without a lot of digging. 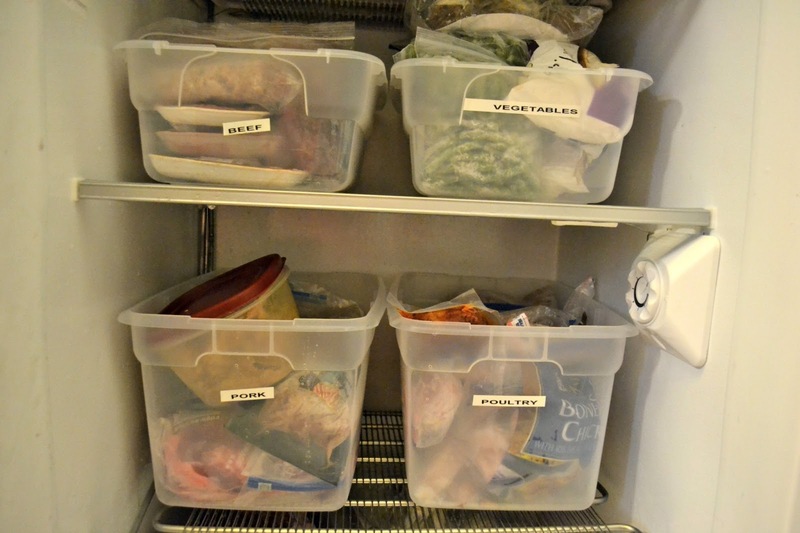 Measure the inside dimensions of your freezer and find containers that will fit. Choose a variety of sizes: I use deep ones for meats, and shallow ones for smaller packages. I like to keep quick dinner things such as hot dogs/kielbasa etc. together in a separate bin than the rest of the meat. Who wants to dig through steaks and pot roasts to find a package of hot dogs? Since I get some of my meats from a farmer, I will get a lot of meat all at once. This also goes for those times when I buy things in bulk from the wholesale club. Say hot dogs, chicken or pepperoni. I will break down into smaller packages and then sort them in categories makes it easier to find what I need. I put all my beef together, but you may want to separate even further if you store alot of meat year round. Steaks in one bin, pot roast in another etc. 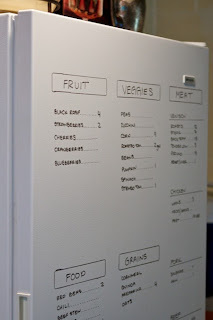 A simple sheet of paper on the freezer door., chalkboard or dry erase board all work well. Write the list in categories then what and how many of each thing in each category. Every time I put some thing in the freezer I write it down or add a talley mark to the sheet. Every time I take something out I cross it off the list. Make sure you use a first in first out on like items. That means in my hot dog bin for example, I'll put the new packages in the back and use the oldest ones in the front first. Here is my VERY favorite way to make a list! Use a dry erase marker right on the door! LOVE it! You Gotta use it!